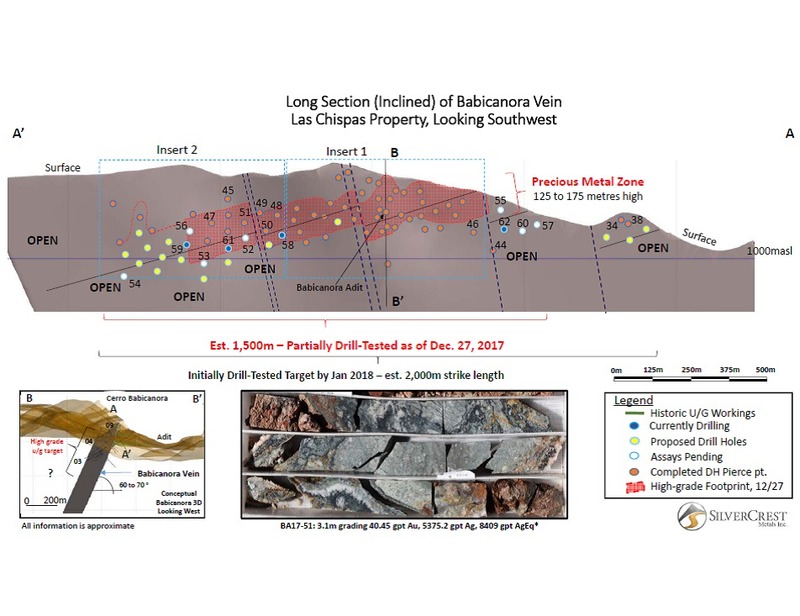 Vancouver, British Columbia--(Newsfile Corp. - December 27, 2017) - SilverCrest Metals Inc. (TSXV: SIL) (OTCQX: SVCMF) ("SilverCrest" or the "Company") is pleased to announce additional Phase II drill results for the Las Chispas Property (the "Property") located in Sonora, Mexico. Infill drilling of the Babicanora Vein continues to intersect high-grade mineralization. 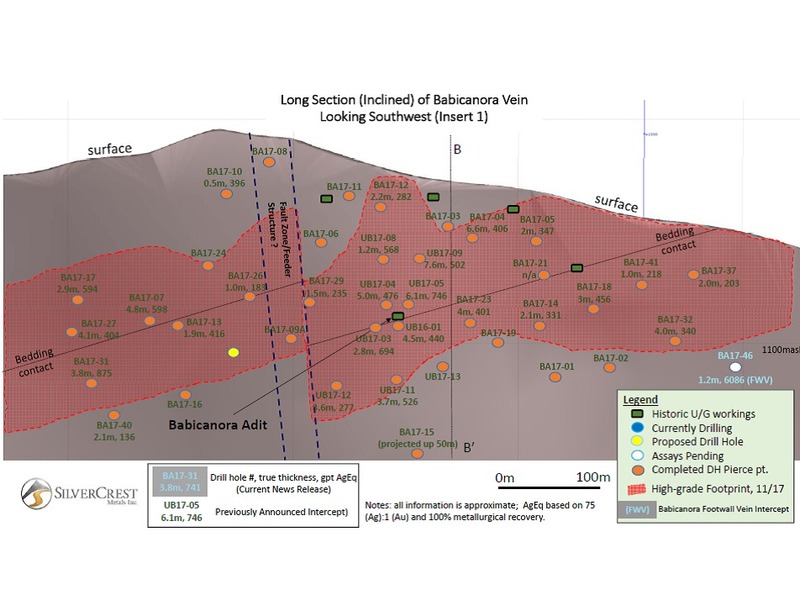 With the latest results, SilverCrest has drill-tested and intersected high-grade mineralization for over 1,000 metres of strike length at the Babicanora Vein (see attached Figures). There are 19 known epithermal veins on the Property, including nine which have been drilled, and consist of the Babicanora, Babicanora Footwall, Las Chispas, Giovanni, La Blanquita, William Tell, Varela, Granaditas and Amethyst veins. SilverCrest has intersected high-grade silver-gold mineralization in each of the nine veins drilled to date. 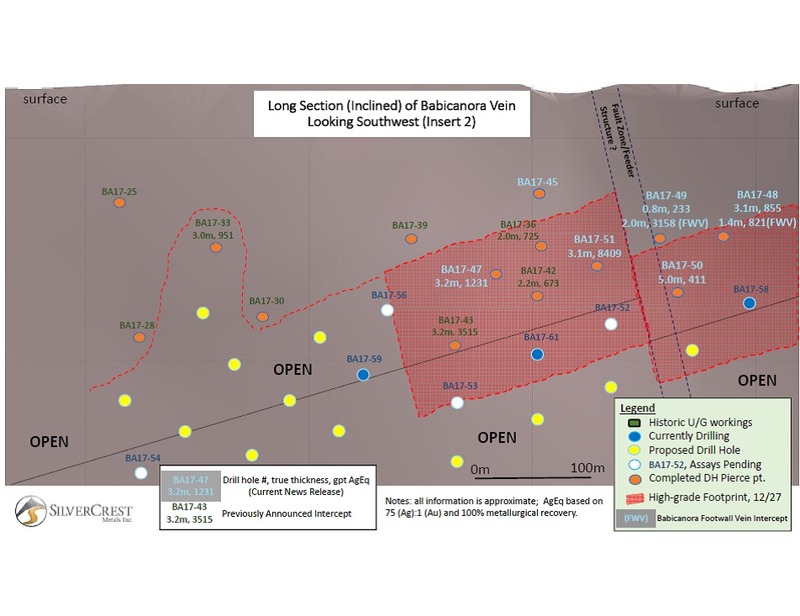 N. Eric Fier, CPG, P.Eng, President and CEO, remarked, "Our continued drilling of the Babicanora Vein has shown consistent high-grades along the drill-tested strike length of over one kilometer, and this vein is open to the southeast and northwest. 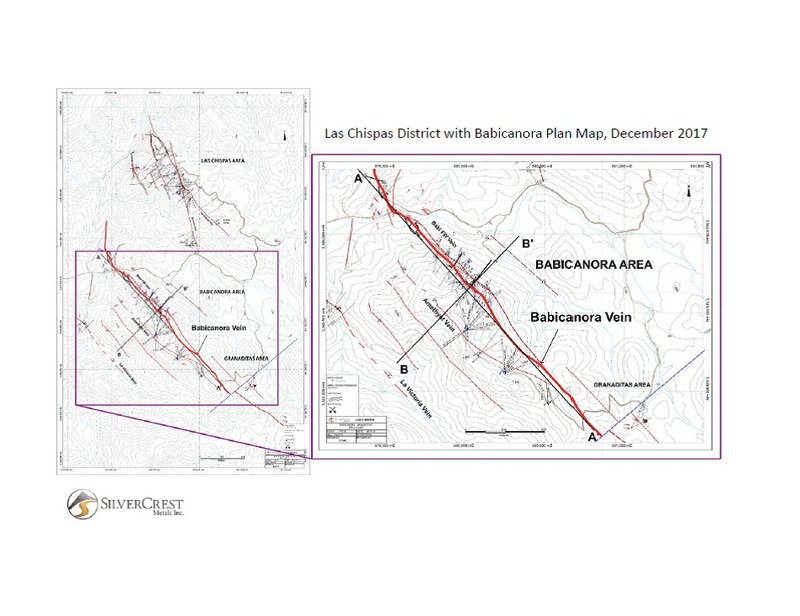 Currently, we are drilling an additional 10 to 15 surface holes at the Babicanora Vein to test for further extensions by mid-January 2018 in anticipation of releasing a maiden resource estimate for the Las Chispas Property in February 2018." Note: all numbers are rounded. *AgEq based on 75 (Ag):1 (Au) and 100% metallurgical recovery. All assays were completed by ALS Chemex in Hermosillo, Mexico, and North Vancouver, BC, Canada. Drill holes BA17-44 and 45 intercepted anomalous mineralization, but are below the Company's 150 gpt AgEq cutoff. Holes BA17-46, 48 and 49 intercepted bonanza grades in the Babicanora Footwall Vein. Hole BA17-51 intercepted bonanza grades consisting of coarse argentite, electrum, native silver and gold. The Company plans to continue with step-out and infill drilling consisting of an additional 10 to 15 surface holes on the Babicanora Vein and ongoing underground drilling on the Las Chispas and Giovanni veins. Furthermore, the Company continues to collect trench samples from the surface dumps. The Company anticipates concluding its expanded Phase II program by mid-January 2018 in time for results to be incorporated into the maiden resource estimate in February 2018. The Qualified Person under National Instrument 43-101 Standards of Disclosure for Mineral Projects for this news release is N. Eric Fier, CPG, P.Eng, and President and CEO for SilverCrest, who has reviewed and approved its contents. SilverCrest is a Canadian precious metals exploration company headquartered in Vancouver, BC, that is focused on new discoveries, value-added acquisitions and targeting production in Mexico's historic precious metal districts. The Company's current focus is on the high-grade, historic Las Chispas mining district in Sonora, Mexico. SilverCrest is the first company to successfully drill-test the historic Las Chispas Project resulting in numerous discoveries. The Company is led by a proven management team in all aspects of the precious metal mining sector, including taking projects through discovery, finance, on time and on budget construction, and production. This news release contains "forward-looking statements" within the meaning of Canadian securities legislation. These include, without limitation, statements with respect to: the strategic plans, timing and expectations for the Company's exploration, rehabilitation and drilling programs of the Las Chispas Property, including preparation of an initial resource estimate; information with respect to high grade areas and size of veins projected from underground sampling results and drilling results; and the accessibility of future mining at the Las Chispas Property. Such forward‑looking statements or information are based on a number of assumptions, which may prove to be incorrect. Assumptions have been made regarding, among other things: the conditions in general economic and financial markets; availability of skilled labour; timing and amount of expenditures related to rehabilitation and drilling programs; and effects of regulation by governmental agencies. The actual results could differ materially from those anticipated in these forward-looking statements as a result of risk factors including: the timing and content of work programs; results of exploration activities; the interpretation of drilling results and other geological data; receipt, maintenance and security of permits and mineral property titles; environmental and other regulatory risks; project cost overruns or unanticipated costs and expenses; and general market and industry conditions. Forward-looking statements are based on the expectations and opinions of the Company's management on the date the statements are made. The assumptions used in the preparation of such statements, although considered reasonable at the time of preparation, may prove to be imprecise and, as such, readers are cautioned not to place undue reliance on these forward-looking statements, which speak only as of the date the statements were made. The Company undertakes no obligation to update or revise any forward-looking statements included in this news release if these beliefs, estimates and opinions or other circumstances should change, except as otherwise required by applicable law.